Last September, I joined The Knitting Guild Association and signed up for their Master Hand Knitting program. It is a three-level course designed to evaluate your knitting and knowledge with the goal of improving the quality of your work. The work is done individually and then submitted to a committee for review. There are knitted swatches, projects, worksheets, questions and essays. When I found this, I thought I’d died and gone to nerdy knitter heaven! My primary goal in completing this course is to challenge myself and learn. I am always looking for ways to improve my crafts and here was a group waiting to help me! The other consideration is that it could give me some credibility in the knitting world to have gone through and successfully become a Master Knitter. I would love for my portion of our family income to come from crafting in SOME capacity and maybe this could open doors to test knitting, teaching, etc. I am currently working on resubmitting the portion of Level 1 that was requested by the committee. It’s hard to be critiqued when you feel like you’ve submitted your best work, but I can already see an improvement on some of the things that were mentioned. I’m anxious and eager to get the materials sent back to see if they have improved and now meet expectations! We’re more than two weeks into the Nothing Past Nine “Grand Re-Opening,” and I want to see what you think and give myself a reality check in the process! You’re currently enjoying the most important aspect of the relaunch which is this website. The idea was to be modern, clean, and highlight the products from the shop. I mean, without the products, there is no Nothing Past Nine! Not only does the website look great, but it has a lot of the functionality that make it more appealing on the back end. Did you notice the URL??? Even something like that is a big deal in the small business world! Social media (and unfortunately blog posts) are still slow going, but elements are coming together. 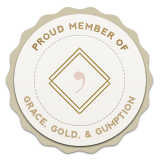 Understanding what I’m posting about and WHY as the girls at With Grace and Gold cannot recommend enough, has helped me gain a better grasp of what I’m doing. Now its starting the process of acting on that knowledge! Lastly, new products have FINALLY been making their way onto Etsy. Woooooo!! If you haven’t checked out our new scarves, do it now! Ok. If you can’t do it now, just do it soon! I know it’s not technically scarf season, but these are some of my favorites to date. (Which is problematic if you’re my husband!) I’ll also be adding some more paper goods in the near future that I’m pretty proud of! How about all of you? What projects have you been working on or goals have you been making progress toward? Are you preparing for Christmas already? I just saw that there are 22 Fridays until Christmas or something like that. Crazy! We are four weeks into our Get To Know Us series! Have you been following along? So far I’ve shared the story of Nothing Past Nine and its name, as well as introduced myself and my sister – the two contributors to the shop. Now that you know us, it’s about time I shared a little about the business itself, huh? 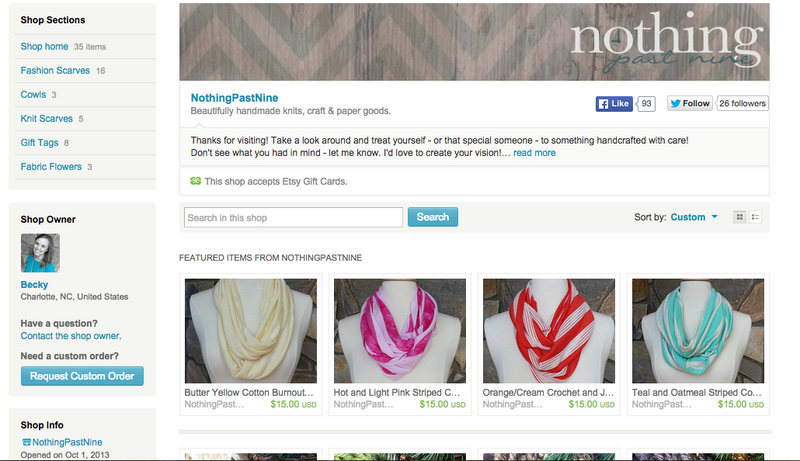 Nothing Past Nine is an Etsy-based online retail shop that specializes in handmade cloth and paper goods. Our primary products are scarves, both chunky knit and cotton fashion, and paper goods include greeting cards and gift tags. The biggest joy of working through Etsy though, is the ability to reach people who want a custom item and trust you to create their vision. These projects are both more challenging and rewarding, pushing us beyond our own imaginations. The Etsy site provides a fantastic avenue for sales, and a small glimpse of what we do behind the scenes. To build this company, expand our reach, and allow us to serve our customers in different ways, we started this blog. As the entrepreneur behind Nothing Past Nine, I have been blessed to have numerous sources of support and guidance regarding small business ownership. This blog is an avenue to build relationships and give back to the community that has been such a big help to me. Even if it’s just to put a smile on someone’s face or add a project to his or her to do list! Finally, another way we try to connect with others is through social media. We have an active presence on Facebook, Twitter, Instagram, and Pinterest, and we hope you’ll follow us for pretty items, fun project ideas, small business tips, great bad jokes, motivation, and more! Our Grand Re-Opening is one month from TODAY! Are you following our sneak peeks? How about our Summer Daze series? Lots of work going on around here! What are you up to? This is the fourth post in our Get To Know Us series. If you missed any of the other posts in this eight part series, you can find them all HERE. Thanks for taking the time to get to know us! I find it ironic that this is the color I am painting my nails today! One of the ideas that many business books preach is setting goals. Never been very good at that – or at least, I’ve never been very good about sticking with and actually documenting goal progress. That being said, I figure it doesn’t hurt to try again! Below are some of my broad goals for Nothing Past Nine and why I’m going about things the way I am. I am going to stay organized. I have a day job that keeps my mind occupied virtually 24-7. While I love organizing and making lists and charts as you’ve learned, keeping my business organized has never been a priority. I would tell myself it isn’t as important, or it’s just a side project, a hobby. Whatever state your business is in, if you love it and want it to succeed, you need to have a handle on all aspects. To do that, you need to be organized. I am going to be consistent. Since opening Nothing Past Nine, I have been woefully inconsistent in my ownership. Days, weeks, dare I say months have gone by where the shop was little more than a passing thought. Check out our social media posts and you’ll see what I mean! I am not giving up the day job anytime soon, but having a direction and being purposeful about my work with the shop will keep me active on a consistent basis. I am going to build a brand. No, I don’t see NPN becoming a worldwide sensation, but I do want it to be a solid brand that stands for something. As part of this re-launch, I have been developing a business plan that includes a mission statement. This wasn’t important to me initially (remember my negative thoughts of this is just a hobby), but having a purpose written out is extremely valuable and has been an incredible process to think through. Now I’m excited to think there is a “why” behind this business! I am going to grow personally and as a business. By pushing myself to develop as a business owner, a crafter, and a person, I believe Nothing Past Nine will reap great rewards. There is always something to be better at, something new to try, and if I continue to put myself out there, there will be huge benefits in terms of business growth and personal growth. I am going to give back. I have been blessed to have found some incredible sources of knowledge, inspiration and motivation since opening the shop. Many are cultivated by women who support the idea of community instead of competition. I have honestly never been very accepting of that concept because I love being the best. As I grow and mature as an entrepreneur (and human being! ), I’ve had to redefine what “the best” means, and I am thrilled to be realigning my views and sharing more of my journey through Nothing Past Nine. I know, I know. These probably aren’t the types of sneak peeks you were hoping for, but they will get juicier I promise! Hope you all have a wonderful long weekend! This is the second sneak peek post! If you missed the first, you can find it HERE. Enjoy! Original concept, huh? Make big changes at the beginning of a new year? Ok, so I’m falling into that cliche idea of making resolutions and having big goals for the next twelve months. It’s like the feeling of a brand new notebook; the feeling of potential. 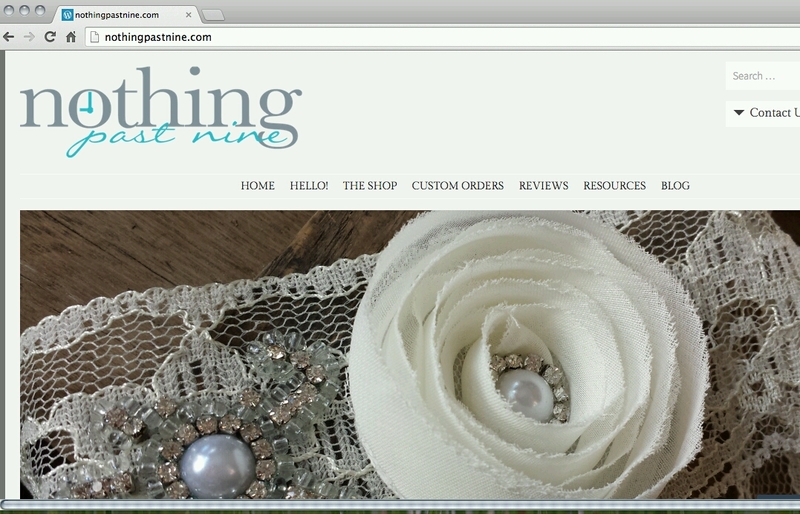 One of the areas I want to focus on with the shop is this blog/website. Hopefully, you’ve stuck with me through the time lapses and will be excited to see the new site take shape. I know I am. I think it will be a big improvement for all of us! The next step in my blogging challenge is addressing the name and tag line for this blog. The name is kind of what it is. I like that it reflects the name of the shop and connects the dots for people that might find me through other means. The tag line though, that’s tough! It’s like a headline, and I always had trouble with those during my Journalism School days. Seriously. How do people come up with these iconic headlines that say so much in so few words?!?! Point is, when I started this blog I used the tag line “Welcome to the world behind the shop” because I couldn’t think of anything better. So I left it at that and hadn’t really thought about it again until now. Not sure the current line completely fits what I’m going for, but then again, it kind of does. I’m so wishy washy!